To those that have sinned after holy Baptism the only remaining hope is true repentance. Glory to God for that! Glory to God, that we have not yet perished, O sinners! A hope yet remains. God's compassions have not yet come to an end. Repentance is still preached to sinners. The poor are still given glad tidings. The Heavenly King still proclaims His mercy everywhere. The doors of compassion are not yet shut. The grace of God is still open to all. The Gospel and the Lamb of God that taketh away the sins of the world are still preached. The Kingdom of God is still proclaimed. Sinners that repent are still saved; both publicans and fornicators cleansed by repentance enter into the Kingdom of Heaven. The compassionate God still calls them and promises them mercy. 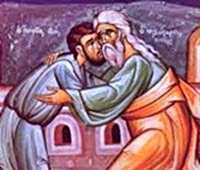 The loving Father still receives His prodigal sons come back from a far country and He opens the doors of His house and clothes them in the best robe, and gives them each a ring on their hand and shoes on their feet and commands all the saints to rejoice with them. "Rejoice, ye angels, and all My elect! Sinners return to Me, men, My creatures, made in My image and likeness, they that have perished are now saved, they that were dead are alive again, they that were lost are found." Glory to His goodness! Glory to His love for man! Glory to His compassion! Glory to His bounties! Poor sinners, why do we yet tarry in a distant country and not go toward our Father? Why do we perish from hunger? Why do we fill ourselves with iniquities as with husks? In the house of our Father is everything in abundance. There, even the hired servants have enough and to spare. Our Father awaits us with great zeal and desire, and with love He will see us returning from afar, and He will look upon us with compassionate eyes, and we shall be dear to Him, and He will fall on our neck running and embrace us and kiss us with His holy love. He will not reproach us, and He will no longer remember our sins and iniquities, and all the holy Angels and all His elect will begin to rejoice over us. Let us hasten, hasten, O sinners, while the time has not yet passed, while the Father awaits, while the doors of His holy house are not shut. Let us repent while the mercy of God still operates, lest we experience the operation of God's righteousness, eternal judgment.